In my ideal universe – besides living next door to Johny Depp and and down the road from Einstein (imagine that dinner party!) – every yoga student would be encouraged to start a home yoga practice the very first time they ever went to a yoga class. In fact, every yoga teacher would teach with the ultimate goal of helping their students establish a regular home yoga practice. Why? Because if yoga is a path to liberation (and it is), a home yoga practice is a must. You won’t liberate yourself just going to class because a home yoga practice is different. Why? Because when we practice yoga on our own, we’re forced to tune in and connect to our own inner teacher. We’re forced to rely on ourselves and, over time, we learn what it is that we need to do. And that’s the thing – yoga is a personal practice. It’s not meant to be experienced in large classes day after day, week after week. Yoga is something personal that you do by yourself, and you do what it is that you need. That’s not possible in a class situation. Yes, classes are valuable – they’re a wonderful way to learn the tools of yoga – the specific postures and techniques we use to come into that state of being called Yoga. Going to class makes us feel connected to a community and it gives us the opportunity to work with an external teacher. But going to yoga classes doesn’t give us that 100% connection to our own inner teacher and the ability to trust where our internal teacher is going to guide us. Plus a class will never give us the exact yoga practice we need because a yoga teacher can’t possibly instruct a class to take account of everyone’s physical, emotional, mental and spiritual needs. Problem is, when we first start practicing yoga at home, we don’t know what we need either. Learning that takes time, and because we don’t instantly know what to do, we feel unsure and lost and confused. And that’s why I suggest that when you start a home yoga practice you keep it simple and you have a set practice that you do every day. Those two things – simplicity and constancy – will keep you on track. Don’t mistake simple for easy though. The postures that look the easiest can often be the most difficult to truly grasp from the inside out because we don’t bring our full attention to them. Lately, one of my most favourite postures to spend serious time in has been Tadasana. Mountain pose. Simply standing still on two feet. Looks easy right? How to you do Mountain Pose? Just stand on your legs and bob’s your uncle. Standing is one thing though, breathing with awareness while standing is another. And noticing how we’re standing is a third. the fourth is adjusting how we’re standing to create greater ease and flow within the body. That’s a whole lot of things and we haven’t even moved yet. And that’s why over the next few months, Seka Ojdrovic-Phillips and I are going to take you on a journey through one of the most well-known, well-balanced and beautiful yoga sequences there is – sun salutations. Whether you’ve never done any yoga before, or you’ve been practicing for a decade, this journey is for you. No matter how familiar you might think you are with sun salutations, you can always go deeper within the form – and going deeper is the practice of yoga. I’m going to write each article, like this one, introducing one pose with some suggested variations. Seka is recording video to go with my article. So you read me, and then you watch her. Our challenge to you is that you then take that posture and make it your daily practice for the next two weeks. You can add other postures as you please, but every single day you spend time in that week’s posture. Over time, we’ll string together a complete sun salutation while also exploring ways you can vary the sun salutation according to the needs of your body. 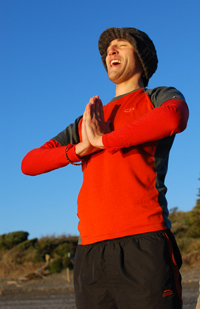 By the time of the journey, you’ll have a solid understanding of sun salutations. You’ll have exactly what you need to practice at home every single day. If you’re finding that life is still getting in the way though – get a copy of Forty Days of Yoga. That will help you make space in your life for yoga. Mountain Pose is a basic standing posture that forms the foundation of many other postures – not just standing poses, but also seated postures. A deep understanding of Tadasana will inform your entire practice. While it sounds so simple – just stand there – there is a huge difference between an embodied Tadasana and merely an idea of Tadasana. Embodying Tadasana means you have full awareness of your entire body – you can feel the soles of your feet grounding into the earth, you can feel your ankles, knees and hips lining up, you can feel your legs engaging, you can feel your pelvis releasing down toward the earth, you can feel your spine growing up toward the sky, you can feel your collarbones broadening, you can feel your shoulders relaxing and softening – you can feel. Best of all, Tadasana is a posture you can do throughout the day. Anytime you’re standing – washing dishes, standing in line at the supermarket, chatting to a friend in the street – you can bring awareness into your body and connect to your breath. Truly master Tadasana, and you’ll master yoga. I floated to the car after my first yoga class. It was the first time I’d gotten into my body just to be, without torturing myself with expectations. For an hour on Tuesdays and Thursdays, I escaped the chains of my cell phone and social expectations and focused on my breath. I fell in love. Prana Flow, Iyengar, Bikram, Ashtanga, Anusara, I loved it all. One day at the Wellington library, I saw a picture of a ferocious woman with a long, black braid standing on her hands with her feet on her head. Two years later, I stood face-to-face with Ana Forrest. Forrest Yoga teacher training was an intense experience. It continues to be an intense experience as all the mysteries of my life unravel through my asana practice and guide my decisions. Yoga is a brave path that I’m honored to walk. I’ve learned so much about myself while on the mat, because yoga leaves no stone unturned. Our life story is written in our cells. The yoga mat is a key unlocking the door to subconscious beliefs that allow for a radiant life. Find me at Spirt Fire Yoga. One of my core values as a teacher is to help a student develop a home practice from the beginning. It’s a very important aspect of the practice of yoga — because it’s meant/designed to be an integrated aspect of your life. Likewise, not only do I teach them how to practice at home “on the mat” but another aspect is the truly integrated “off the mat” practice experience — integrating yoga principles and practices into everyday life, to make live better for the practitioner and his/her community. Love your work – and great to hear your take on this. Yeah!!! I am not a yoga teacher – but I love learning new poses, etc. Unfortunately every one of your videos are not loud enough to hear what is being said. If this is not corrected, I will ask to stop receiving your emails – so I am hoping something can be done. Have you listened to the most recent videos we’ve done? This one is a couple of months old and the feedback we had on sound wasn’t good. So we took it into account and have been doing our best to capture better sound with our limited equipment. The latest video on Chaturanga Dandasana has much better sound.